Preheat the oven to 350º F. Brush the bottom and sides of a 9 x 13-inch baking dish with 2 Tablespoons of the melted butter. Slice two of the potatoes as thinly as possible, about 1/8-inch thick. Arrange a single layer of the potatoes on the bottom of the baking dish. 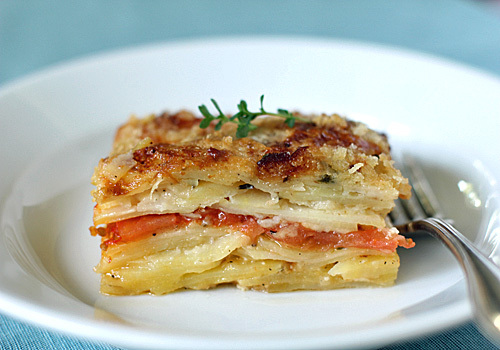 Top with a second layer of potatoes. (It is best to slice the potatoes as needed per layer because the starch in the potatoes helps hold the layers together). Brush the potatoes lightly with a portion of the melted butter. Sprinkle with salt and pepper, about 2 teaspoons of the thyme, 2 tablespoons of the Gruyère, and 1/3 cup of the Parmesan. Slice and add 2 more layers of potatoes, brush lightly with melted butter. Sprinkle with salt and pepper, about 2 teaspoons of the thyme, about 2 tablespoons of the Gruyère, and 1/3 cup Parmesan. Add a single layer of tomatoes and top with 2 tablespoons of the Gruyère, 1/3 cup of the Parmesan, 2 teaspoons of the thyme, and season lightly with salt and pepper. Continue this process with two more layers of potatoes. Press firmly with the palm of your hand to pack all of the ingredients together. Brush lightly with the melted butter, sprinkle with the remaining thyme, season lightly with salt and pepper, and sprinkle with the remaining Gruyère. In a small bowl, combine the bread crumbs and panko; set aside. Pour the half-and-half and the chicken broth over the potatoes and top with the bread crumb mixture. Drizzle the remaining butter over the bread crumb mixture and bake, covered with foil, for 45-50 minutes. Remove the foil and bake uncovered for 30-40 minutes longer or until the gratin is bubbling and golden on top and the potatoes are soft when pierced with the tip of a sharp paring knife. Let rest 10-15 minutes before serving. Serve warm. Enjoy! YUM! This sounds amazing and looks even better! Can you put together and let sit overnight? I want to prepare the night before and put in oven in morning. Or will the potatoes soak it all up? Since the potatoes aren't cooked, they will discolor. This gratin reheats beautifully, so I would recommend baking it the day before and reduce the cooking time by 10 minutes once the foil is removed; allow to cool completely, then cover and refrigerate over night. Remove from the refrigerator and allow to come to room temperature. Reheat in a 350º F oven until warmed through, about 20-30 minutes. This recipe is fabulous! My whole family loves it... looks and tastes so gourmet! Thanks so much! I am thrilled that it is a family favorite. It pleases me to share ☺. I was thinking of making a gratin, but had never seen tomatoes in one. I tossed potato, tomato, panko, and heavy cream into a google search and your recipe came up. It looks amazing! I am going to try your recipe tomorrow. Thank you so much for sharing it, it's just what I was looking for!